Anti-globalization in the 1990s and early 2000s was overwhelmingly a phenomenon of the Left. But now that the mantle of anti-globalization has been taken up by the Right, it will be interesting to see how many on the Left do an about-face, and also to see if the Right can succeed where the Left has consistently failed. The first major anti-globalization protest was against the World Trade Organization in Seattle in 1999. This was the now-famous “Battle in Seattle,” endlessly celebrated as a victory by the Left because the protesters actually succeeded in shutting down the WTO meetings for a whole day, even though in the long run this accomplished absolutely nothing. It is also celebrated for its brief (very brief, as in a couple of days) alliance between union groups, which represented American manufacturing, and environmental groups like Earth First! “Teamsters and Turtles, Together At Last” read one protest sign, as union men marched side by side with Leftist “street theater” kids, looking not a little uncomfortable about the juxtaposition. At the time, President Clinton surprised everyone by making a statement in favor of the protesters, saying that the WTO attendees should “listen” to them. (Listening was then a popular theme among liberal politicians; Jonathan Bowden mocked Tony Blair for this .) It was typical Clinton doublespeak, since he has probably done more to promote globalization and destroy America’s manufacturing base than any other American leader, first by signing NAFTA into law, and then paving the way for China’s entry into the World Trade Organization by removing consideration of their human rights record from the renewal of its Most Favored Nation status. It was subsequently revealed that Chinese billionaires were making large, illegal donations to Clinton’s campaign. Anyone who lived through those times will remember that the Clinton and Bush years were the time when the flood of cheap Chinese products into America began. The next big anti-globalization protest was less than a year after Seattle, this time in Washington D.C. against the World Bank and International Monetary Fund. It should be noted that, both in Seattle and D.C., the vast majority of Leftist protesters were incapable of explaining what, precisely, was the problem with the WTO and the World Bank/IMF. Most were simply and vaguely “against the system,” which they identified variously as capitalistic, imperialistic, patriarchal, racist, or some combination of all of these. Many of the protesters, especially the younger ones, self-identified as Communists or anarchists, which for most of them was little more than a temporary identity flirtation, akin to deciding that one is a punk rocker and getting a leather jacket and some hair dye from the mall. Most would go on to become rather standard and dull liberals, and I strongly suspect that an overwhelming majority of them voted for Hillary Clinton (if they voted at all) with little to no memory of having vigorously opposed the Clintons back in the ’90s. Whereas most of the protesters were non-violent, being the usual bunch of hippies, Communists, New Age peaceniks, and the like, the Black Bloc not only destroyed property but sometimes fought with police. For this reason, there was active debate among the Left as to whether they should support or disavow them. 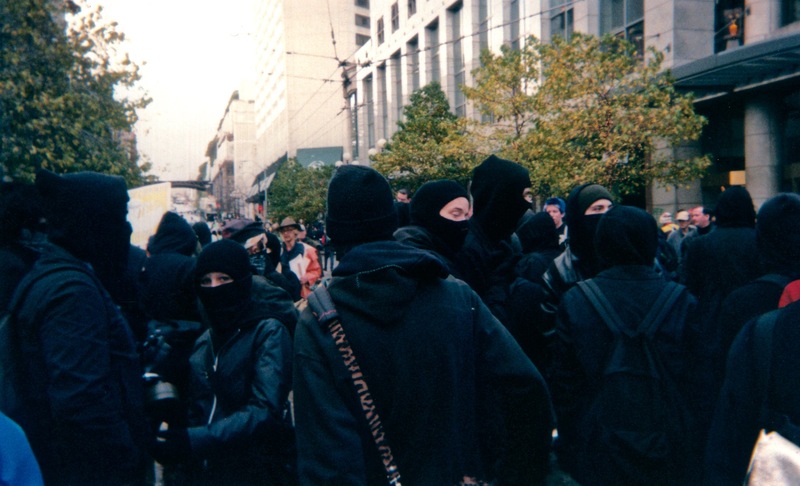 The general consensus was that, although many protesters did not support the tactics of the Black Bloc, those tactics helped to normalize the positions of the movement, by pushing the Overton window and making the non-violent protesters look tame in comparison. 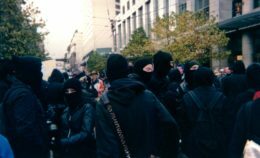 Furthermore, a number of non-violent protesters said that they actually felt safer knowing that the Black Bloc was there, because they were like a protection squad. At the very least, the police were likely to be distracted by them, and therefore not have as much time to tear gas and pepper spray the others. It will be interesting to see if a far-Right equivalent to the Black Bloc emerges. The recent attack on Richard Spencer by a Black Bloc member makes it clear that Right-wing activists need to defend themselves against violence from the Left. The major turning point in the anti-globalization movement was 9/11. Some on the far Left cheered the destruction of the World Trade Center towers – twin symbols of global capital – as was said at the time by rapper KRS-One. But that was hardly a position to win over the public in a time of national shock and mourning. For most Americans, globalization and its economic consequences in America (the Left never cared about the cultural consequences) suddenly paled in comparison to an existential threat from the Islamic world. The War on Terror triggered the Left’s knee-jerk defense of any non-whites against whites. The response of the Bush administration to 9/11 – which was, let’s face it, monumentally stupid in so many ways – was opposed by the Left as a racist, Islamophobic crusade of white supremacist Christian capitalist sexist oppressors who hate brown people and children and puppies. The identity-based issues that already co-existed beside economic issues in the confused Leftist platform came to dominate. What is remarkable is how completely the Left has abandoned the white working class in the last twenty years, despite the fact that the proletariat is supposed to be the Leftist demographic. Couple this with conservatism’s open disdain for the white working class , and you have no small part of the reason for the rise of Trump. The historical Left dreamed of an alliance of the “workers of the world.” Perhaps realizing the futility of that dream – or perhaps not, since realization and acceptance of truth is not really the Left’s forte – they have largely moved on to the new dream of an alliance between the many and disparate groups which they claim to represent the interests of, such as blacks, Latinos, Muslims, gays, transgenders, the disabled, and women. What is supposed to unite this rainbow coalition of the oppressed is, at base, hatred and resentment of successful straight white men, which the Left hopes can win out over the coalition members’ various incompatibilities with, and hatreds of, each other. The Left has accepted the idea that “globalization is inevitable,” which is not surprising since their ideology has always been international/anti-national and universalist in its essence. For nearly twenty years now, the only people making any serious criticisms of globalization have been the European New Right and American paleoconservatives. But then came Trump. Reworking much of Pat Buchanan’s rhetoric and platform from previous decades, and combining it with the grandiosity of his personal style, Trump is the first major American politician to criticize the global trade agreements that have decimated American manufacturing and facilitated the particular form of globalization that has been happening since the the mid-twentieth century. I don’t recall a presidential candidate making any serious criticism of NAFTA since Ross Perot in 1992, before it even passed. And now, Trump is no longer a candidate, he is the President. He has a lot on his plate. The trade deficit with Mexico is $60 billion. It is probably even higher than that if one factors in the number of illegals working in the U.S., repatriating some or all of their earnings. The trade deficit with China is a staggering $367 billion, which is also probably higher when Chinese theft of American intellectual property is factored into the equation. But then, is it really “American” IP if the corporation that owns it has no loyalty to the United States, employing mostly foreign labor and having its headquarters in an offshore tax haven? President Trump is forcing a re-evaluation of not only the meaning of American citizenship, and its attendant responsibilities, at the individual level, but also at the corporate level. As the Leftist self-caricature Michael Moore noted before the election , no one has ever stood up to “American” corporations for shipping jobs to other countries the way that Trump has. If the Left no longer cares about the white working class enough to appreciate this, the Right – the real Right – does. It’s too soon to praise Trump for deals and renegotiations not yet made, but all indications thus far are that he fully intends to make good on his promises to American workers. This was originally posted on the blog  of Martin Aurelio.